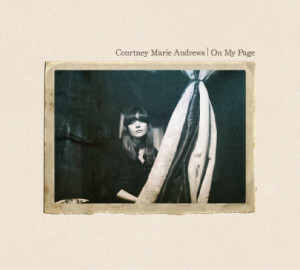 Who is she: A Phoenix native, Courtney Marie Andrews released her first album Urban Myths in 2008 at age 17. She’s put out three albums since. Besides making music since 2008, Andrews has been involved in organizing various folk festivals throughout the Phoenix area. She is currently based in Seattle, and is releasing On My Page on April 23. You’ll like it if… you like to feel like your music is wrapping you in a big blanket on a cold snowy night. This is one warm sounding album and Andrews’ voice is beautiful throughout. You’ll also probably like it if you like Joni Mitchell, honest personal folk lyrics, and delicate fingerpicked guitar. Avoid if…you don’t like a stunningly beautiful vocals, or are looking for a more contemporary take on folk. About the album: On My Page shows its hand immediately with the lead track, ‘Women of many Colors’–and that proves to be a good thing. While it’s not an adventurous or eclectic album, like the first track, the rest of the tunes are cozy and comforting with their focus squarely where it should be–on Andrews’ smokey, intoxicating vocals. And what a voice it is; powerful yet delicate, smooth and velvety, and always in the right place in terms of phrasing, dynamics and note choice. With the exception of a few full band tracks, there isn’t much track-to-track variation in the sparse arrangements, but the album never sounds repetitive or boring. On the contrary, the sonic similarities between tracks make On My Page the most polished finished work of Andrews’ releases. All of the songs on On My Page were written by Andrews. Her lyrics are intimate, personal, and genuine; so much so that Andrews routinely name-drops actual friends and real spots where the songs take place. Throughout the course of the album we learn about a host of characters, including her lost loves, troubled friends, and an incarcerated painter. We also learn of her perceived personal shortcomings and seemingly omnipresent melancholy. (‘Haven’t Seen it’, ‘Blue Women’). Despite the breadth of themes put forth, restlessness is a prevailing thread (‘This Time’, ‘On My Page’, ‘Women of Many Colors’). It seems that Andrews is constantly searching for her place in both the physical and societal world. Still, even with such personal lyrics, casual listeners will likely be able to find themes and ideas that they can relate to. The production on the album is stellar, and On My Page sounds like it was recorded on a long winter night in a cozy log cabin (it pretty much was: http://www.bearcreekstudio.com/). And, not to take anything from Andrews as a vocalist, but Ryan Haddock (co-producer/co-engineer) really improves the tonal quality of Andrews’ vocals as compared to her previous releases. Instrumentally, the acoustic guitars are round but clear and compliment Andrews voice perfectly. Same goes for the piano, drums, and bass, while tasteful pedal steel licks and the occasional string arrangements tie the whole album together. Although this album is the near opposite of a funk record, the musicians seem to approach the arrangements in a similar way: focus on the greater good–the final song–and only contribute what’s absolutely necessary. The result is a group of backing musicians who never sound out of place and who never inadvertently dominate an arrangement. One exception is the intro to ‘Left-handed Angel,’ where the Cellist’s note choice seems a little out of sync with the songs chords. Best Song: ‘Haven’t Seen it’: This tune features the whole band and what starts as mid-tempo simmer reaches a full scorching burn by the song’s end. Vocally, the arrangement features great dynamics between the almost whispered high notes of the verse and the chorus, which features reverb drenched angelic backing vocals. It seems like the whole band is just really into playing the song, with each member contributing the substantial energy that acts as fuel for Andrews’ most powerful vocals. The final 1:30 gave me goosebumps, as the band was fully unleashed for the first and only time on the record. I would have liked another similar arrangement on this record, but I’ll take what I can get. Worst Song: ‘Blue Women’: It’s short, a little whiny and almost feels incomplete. Not bad on its own but it doesn’t really hold up against the quality of the rest of the songs. The chorus was cheesy and whenever Andrews sings “and you are my blue man” I kept thinking of Tobias from Arrested Development as her blue man. Not the image she intended, I’m sure, but I couldn’t help it. It’s the first of many times we see themes of traveling and indecision. A fitting intro to the rest of the album. Bottom Line: This is not only a great album in its own right, but Courtney’s greatest release as well.